← BAM! HE’s got you! 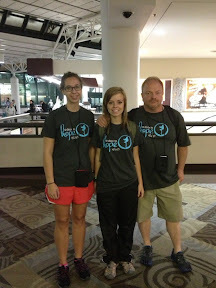 On Saturday, (R to L) my husband J, daughter Braden, and friend Sara, left for Haiti to serve with a ministry called A Door To Hope with Brent Gambrell. This is a picture of them at the airport just before we left them at the gate. This is the area they are living for the week. I have talked with them several times. God is doing amazing things. They sound different every time they call. I love it! They are staying in bungalows near the ocean that a group from Canada built for the area a while back. They are there to help a nurse named Jenny who came there to serve some time back, and has since moved there. They have two guards there. Today, Braden and Sara will be working at the clinic helping nurse Jenny and then at the orphanage where she will teach. Braden is having the time of her life. She is embracing all the hardships like a trooper and has a joyfulness in her voice that says she is soaking up every minute with a smile on her face. She is eager to get to work and explains every minute of her time. I love it! She says Sara is doing GREAT which is no surprise at all because she is always great! J has been placed in charge of the men there. 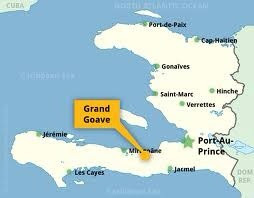 He is directing projects with the Haitians and other missionaries there. Today, he goes for the morning with the girls and assesses and works on the school and will help at the orphanage. The school, the church, the clinic and the orphanage are near each other but about a 30-45 min (rough!) walk from where they are sleeping. After lunch, the girls will go with a team back to the orphanage and J will stay on the compound with some Haitian men and direct the rebuilding of the walls, securing the bungalows, etc. he spent yesterday afternoon talking with the Haitian men about what they need to gather on their THREE HOUR…(ONE WAY…THAT MEANS 6 HOURS)….trek to the market area. (I will remember this next time I complain about my terrible 10 minute DRIVE to Walmart! Ugh! We are so spoiled!). J is so moved by the people and the conditions there. He tells me every minute of his day too as he is so touched by them. The people are curious about them. He is a strong leader with a huge heart. I know he and Braden are going to fall in love with those children today! Pray for safety today as they work. Pray for supernatural protection, strength, wisdom, and love to and through them today. I know and pray as He says in Isaiah 52 and 58, He will go before them and be their rear guard. It looks like the humidity is at 91% today so pray for their supernatural comfort as they serve. Pray for the opportunities I know God has for them to share His Gospel as they serve. I know God is going before them and preparing hearts for the message. Thank God for each person that came before my family and friend got there and built those bungalows, the clinic, that school, that orphanage and that church. Thank Him for nurse Jenny and her work there and for Brent and A Door To Hope as their work there. God’s glory forever. Pray for the people there. How beautiful this ministering must be to God!!! I know He is pleased!! !